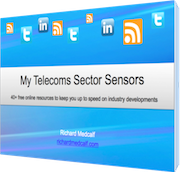 One of the reasons that telecoms revenue growth in developed markets is so anaemic these days is that voice and broadband have just been too big for too long! Rather than develop new strategies for the future and experiment with new service categories, it has been so easy to ride the next multi-billion dollar adoption curve: fixed broadband, mobile voice, SMS, mobile data – or put prices up in one of your less competitive service areas. In developed markets, there doesn’t seem to be another big adoption wave coming so many service providers are making big bets on emerging economies to drive their growth. In other words, play out the same game, but elsewhere. This makes sense of course, but riding the voice and Internet access penetration curves waves around the world is just delaying the inevitable. Without a clear strategic vision for the role that telecom operators should play in the Internet world, the industry’s long-term future is bleak. So clearly a two-pronged strategy is needed: make the most of emerging market growth whilst getting the strategy right in developed markets. Emerging market telecoms revenue growth is actually a blessed relief. Because by the time your revenue stalls, it is already too late to do much about it. The challenge facing telcos is to make the investments in new product and service categories – despite them often appearing to represent peanuts in the short term – as they can be significant strategic moves. As an illustration, consider two identical firms with revenues of $100M in year 1. These “core” revenues are growing at 10% annually, but this growth rate is reducing by two percentage points per year (so 8% in year 2 …. 0% in year 6… and -8% in year 10). New revenues from what we might call “value-added services” will take 3 years just to get to $1M – a measly 1% of the starting turnover, and then grow 50% annually thereafter. One firm launches its new value-added service initiatives at the start of year 1, and by year 3 has generated its $1M in value-added services. The other firm waits until growth is flat (start of year 6) before diversifying, reaching its $1M in year 8. Have a look at the chart to see how the revenue curves pan out. Here’s the thing: by year 6, revenues at the two firms are practically identical (2% difference). All that effort has still not moved the needle significantly. But by year 10, the early diversifier has pulled ahead: the revenue gap has widened to 12%, and the telecoms revenue growth rate at the “early diversifier” is 400 basis points higher than that of the other firm. 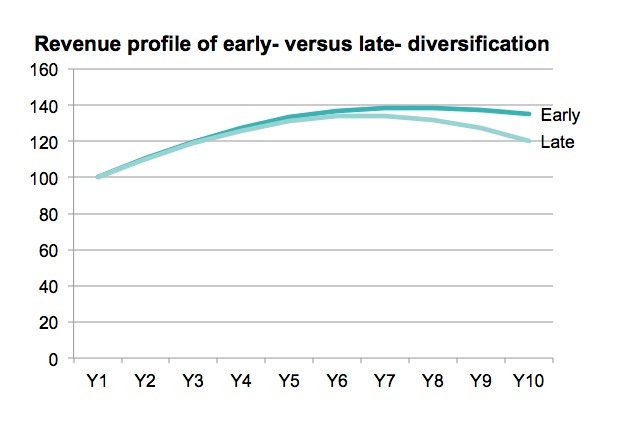 Value-added services come to represent 14% of the early diversifier’s revenues by year 10. The moral of this tale? Telcos must not get so intoxicated by emerging market growth that they fail to sustain experimental early-wave strategy and service categories which will be their future.